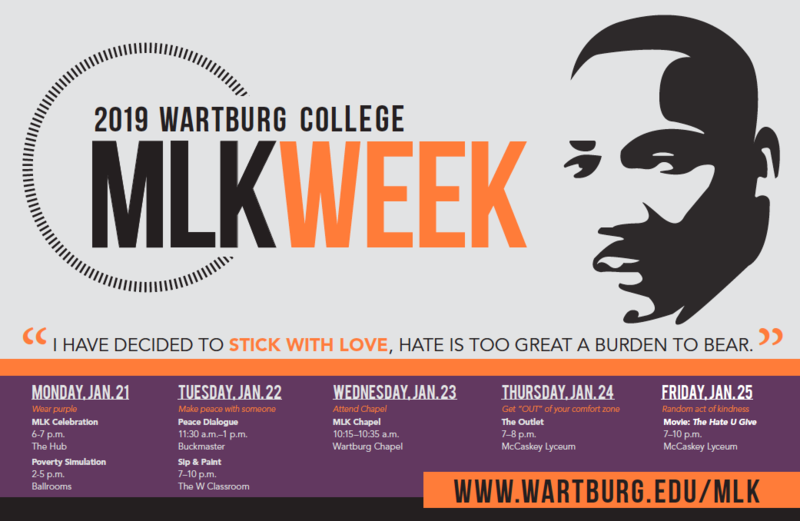 Wartburg College events, service projects honor Martin Luther King Jr.
Wartburg College will host several events honoring civil rights leader Martin Luther King Jr. during MLK Week, Jan. 21-25. As part of its MLK Week tradition, the college will shorten its class schedule Monday to allow all students to participate in a variety of service projects organized by the student-run Volunteer Action Center. The MLK Week Committee is partnering with ETK, the college’s student-run entertainment organization, to host a screening of the movie “The Hate U Give” on Friday, Jan. 25, at 7 p.m., in McCaskey Lyceum. The event is free and open to the public. A poverty simulation, Monday, Jan. 21, 2-5 p.m., in Knights Ballroom of Saemann Student Center. An MLK Celebration, Monday, Jan. 21, 6-7 p.m., in The Hub in Saemann Student Center. A Peace Dialogue, Tuesday, Jan. 22, 11:30 a.m.-1 p.m., in White House Business Center Room 214. Sip & Paint, Tuesday, Jan 22, 7 p.m., in The W classrooms. The Outlet, featuring performances by a diverse group of students expressing social justice through dance, poetry, song and various performances, Thursday, Jan. 24, 7 p.m., in McCaskey Lyceum.